When we envision a classroom we always tend to think of the traditional layout: rows of desks, a black or whiteboard, an old back lit projector, pencils and paper, and books stacked on shelves, but as the great Bob Dylan once sang, “the times they are a’ changing”. The classrooms of today have become more advanced and are taking advantage of the fast moving technological innovation that we have seen come to pass over the past several decades. So now, let’s take a moment to envision how the classroom of today might be a little different. Well the desks probably haven’t change much, but that old chalky blackboard at the front of the classroom has most certainly been replaced with a much more engaging interactive flat panel (IFP). 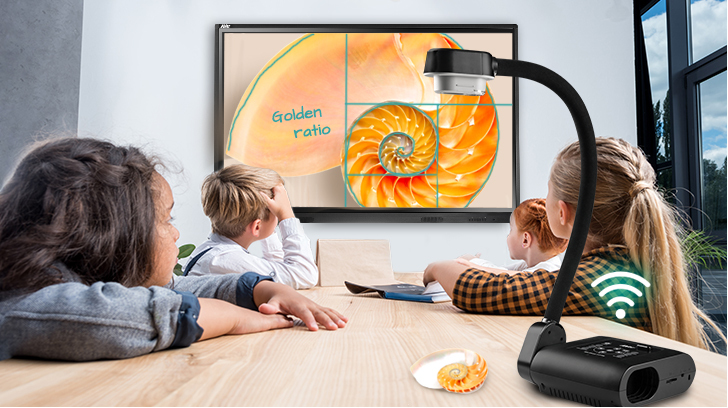 The old back lit projector is now a flexible and versatile interactive visualizer paired with a classroom conferencing system. Pencils, paper, and that stack of books are now tablets and laptops connected to the biggest library in the world through wi-fi and stored in efficient charging and sync cabinets for easy access. These new learning tools are revolutionizing what education can be, but they also are doing one other very important thing and that is creating more 'connections’. Let’s see how each one of these exciting inventions help increase connections in the classroom. 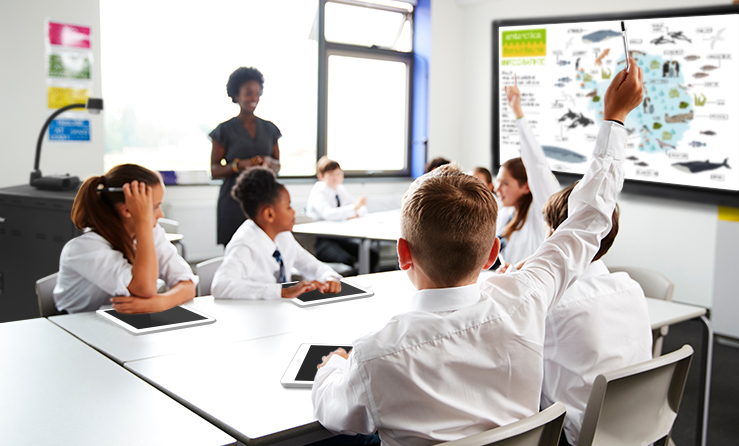 Interactive flat panels are the glue that holds the connected classroom together. Acting as the main focal point of the classroom, IFPs are the root from which all connections in the classroom are grown. Let’s go over the reasons why. First, IFPs are capable of performing all of the tasks of traditional black or whiteboards with their annotation capabilities, touch screen functionality, and built-in templates, but that is not all. IFPs allow for the download of education apps, connection to the internet, and ability to play videos directly from the IFP, a connected laptop, or a USB drive. Secondly, IFPs provide direct connections between students’ in-class digital devices and the front of the classroom. This allows students to instantly share their work or discoveries directly to the front of the class without ever needing to get out of their seat. Integrating first and third party education applications can also allow teachers to poll students, students to answer questions, or share their annotations on material instantly so more 1-on-1 teacher/student interactions can be obtained. With their ability to also connect with other classroom technologies, including video conferencing cameras, visualizers, etc., IFPs allow for a class of students to truly express themselves and explore their creativity. Finally, IFPs bring more connection between administrative staff, teachers, and students. By connecting classroom IFPs to a centralized “hub”, administrative staff are able to setup message broadcasting to the IFPs to bring awareness to certain events or to remind students and teachers of ongoing activities. Visualizers are the new presentation tool that let classrooms explore every detail. They play the role of a digital projector and come in a variety of different designs from flexible necked, mechanical armed, USB, and wireless. These different designs are meant to fit the requirements of different course types. 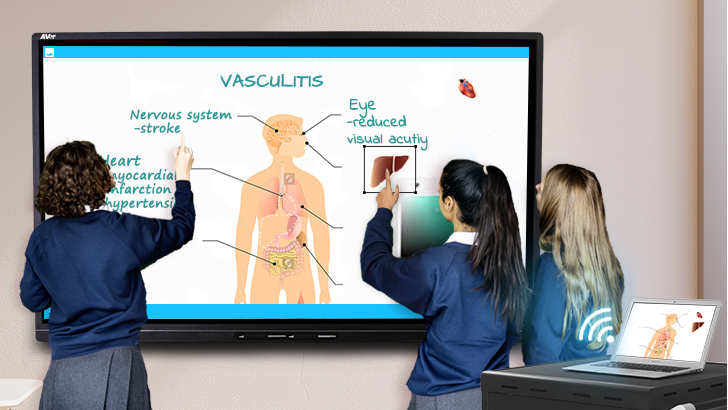 Connecting these visualizers with an IFP allows for physical material to be easily displayed and shared with a class. With wireless visualizers students find a best friend when needing to show material from their desks to the class. Classrooms have said goodbye to the clunky back lit projectors and are saying hello to these flexible presentation solutions that bring a new sharing experience to students. 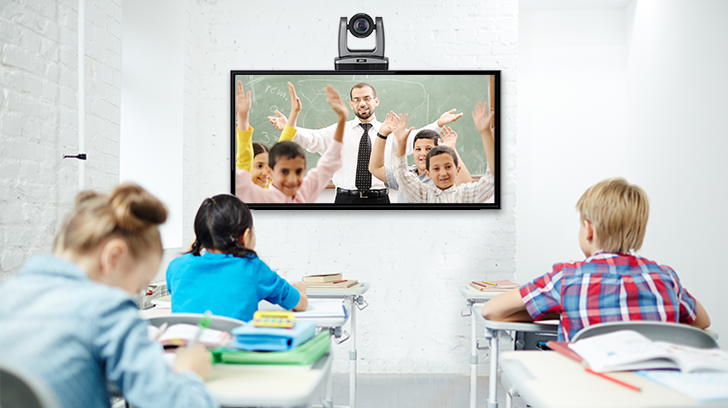 Classroom video conferencing is something that has been gaining more and more prominence in classrooms around the world and they play an important role in driving connections. Schools have even begun to use video conferencing for remote learning opportunities and are helping to alleviate some of the strain on schools facing teacher shortages. Video conferencing in the classroom is perfect for cultural sharing and can help build international connections between classes. Students are able to learn, from a young age, about different countries and the students that occupy them. Classrooms can also bring in guests or topic experts into the classroom in an affordable manor so that students can connect with new experiences and new topics of interest. Overall, video conferencing is playing an exciting role in the development of young learners everywhere by not only building connections in the classroom, but outside it as well. Tablet and remote learning brings a 1-on-1 teaching approach into the modern classroom. 1-on-1 teaching has been a method that has been fading in schools as class sizes have grown larger. Device and tablet learning has been a major equalizer when it came to creating better and faster communication between students and their teachers. With a wide variety of apps available to schools, teachers are able to provide quick and constant feedback to students and are also able to evaluate individual student’s abilities at a micro level. Find Out How AVer Can Help You Stay Up to Date.